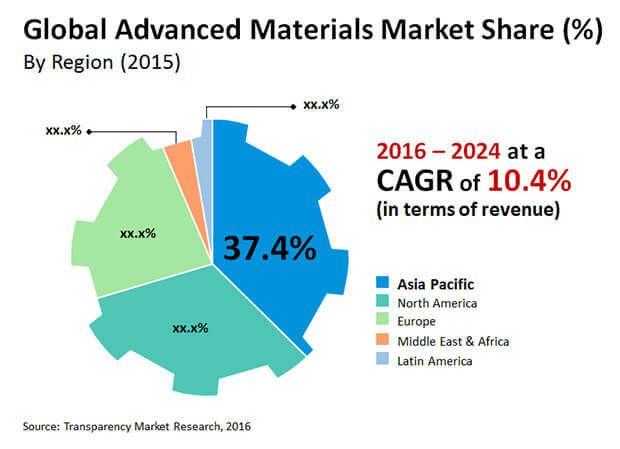 The global advanced materials market is forecasted to witness a positive growth curve in the forthcoming year, as reported by Transparency Market Research (TMR). The competitive landscape of the global advanced materials market is reported to be highly concentrated. A single vendor, 3M, in the global advanced materials market accounts for nearly three fourths of the overall market share. The company is expected to continue holding a dominant position in the market over the coming years. This could be attributed to their wide product portfolio, and extensive proprietary technologies. New vendors are expected to use 3M’s expertise as a benchmark when entering the global advanced materials market. Deep pocketed investors are expected to compete to gain more shares in the advanced materials market in the coming years. Vendors are further seen allocating huge chunks of resources to research and development activities. Key vendors operating in the global advanced materials market are Huntsman Corporation, 3M Advanced Materials, Morgan Advanced Materials, Hanwa Group, and Hexcel Corporation. The global advanced materials market is foretold to rise at a 10.4% over the forecast period 2016 to 2024. The market was estimated to be worth US$42.76 bn in 2015 and is prognosticated to reach US$102.48 bn by 2024. The increasing demand for these materials is driven by innovative applications of advanced materials in various end use industries. The product is used, for example, in applications in the industries such as automotive, heavy machinery, construction, and solar glass industries. For solar control efficiency and other applications, flat glass coated in the construction industry is applied because of the product's excellent insulation properties. The need for flat glass in the architectural sector over the coming years is expected to rise. Materials that can sustain fire, impact, harsh weather and natural disasters is expected to drive the demand for advanced materials. The complex process involved in producing these materials is the main factor limiting the development of the advanced materials market. In addition, manufacturing of such materials requires the workforce involved to provide high cost, expensive machines and technical expertise. Those factors therefore limit the acceptance of new players to a certain extent. The fuel economy of cars is up 6-8 percent with the reduction of one-tenth of weight, according to Scientific American, an American science magazine. In light of this, the auto industry focuses more and more on developing vehicles that are both lightweight and energy-efficient. For example, Nissan automakers have decreased the mass of their cars such as Altima, Frontier and Juke to improve their fuel efficiency. Demand for lightweight vehicles is a key trend expected to influence the world's advanced materials market in the next several years. Moreover, increased consumption of consumables and increased use of advanced materials in areas such as healthcare, aerospace, cars and others worldwide are intended to provide suppliers of advanced materials worldwide with an absolute opportunity.